It’s been quite the year for the healthcare industry. Change was seemingly everywhere—and yet some said there wasn’t enough. To summarize all that went on would be difficult. To compensate, For The Record polled several people and organizations in the know to gather a general overview of 2009. Our distinguished panel features members of the HIMSS North American team*, the Medical Transcription Industry Association (MTIA), and the Association for Healthcare Documentation Integrity (AHDI)**; the American Academy of Professional Coders’ (AAPC) President and CEO Reed Pew and Vice President of Business and Member Development Rhonda Buckholtz, CPC; Dan Rode, MBA, CHPS, FHFMA, vice president of policy and government relations at the AHIMA; and François de Brantes, CEO of Bridges to Excellence. For The Record (FTR): What grade would you give the Obama administration for 2009? Please explain. de Brantes: I would give the administration a “B” overall. While the HITECH portion of the ARRA [the American Recovery and Reinvestment Act] is a big deal (and by itself would generate an “A”), its execution so far has been mediocre, partially because of the delays in setting the meaningful use criteria. The lack of clarity has created far too much uncertainty for physicians about which EMR system to buy that will qualify for the subsidy. Second, we’re still waiting for a CMS [Centers for Medicare & Medicaid Services] administrator over nine months into the new administration. That’s simply crazy and has consequences on CMS’ ability to set an agenda and pursue some of the initiatives that had been put in by the prior administration. On the other hand, the administration has pushed aggressively for healthcare reform and is making headway. • The codification of the Office of the National Coordinator has heightened the nation’s commitment to improving the quality of healthcare, while containing costs, through the best use of IT and management systems. • The appointments of policy makers such as, but not limited to, Kathleen Sebelius, Peter Orszag, Aneesh Chopra, David Blumenthal, and Mary Wakefield to key positions in the administration has placed a cross-administration emphasis on ensuring reformation of healthcare in part by harnessing the power of health IT. • The appointment of David Blumenthal—a self-proclaimed EHR user—now on the job getting clinicians to adopt IT and become meaningful users. • The rapid startup of the [Health] IT Policy and [Health] IT Standards committees. • Open and welcome public debate within both committees as meaningful use and standards/certification criteria recommendations have been developed. • Early emphasis on meeting congressional requirements for including health IT solutions in community health center infrastructure grants. • The anticipated $30-plus billion investment in health IT that will solidify the infrastructure for health reform. AHDI/MTIA: Given the severity and complexity of the issues facing America as President Obama was taking office, he has earned an “A.” Here’s why: From inauguration day, he has united this country and energized the American people in a way we haven’t seen before. Already, our nation’s position in the eyes of the world is improved, which in part for his leadership and vision contributed to his earning the Nobel Peace Prize. As a nation, we can be proud of this honor. Can you name any other president that has had to simultaneously deal with a war on two fronts, economic depression, a housing market in steep decline, a double-digit unemployment rate, stock market at lowest levels since the ‘80s, major financial institution closures, the big three automakers on the verge of closing their doors forever, and a healthcare system that has long needed reform and contributes to individual and corporate economic stress. We need to remain patient and be grateful that there are plans to address all of these issues. While the debate goes on about the best ways to get these all in check, we are seeing solid signs of improvement. These things did not happen overnight nor can they be improved overnight, but courageous leadership will resolve our nation’s challenges and build a foundation for a stronger future. FTR: What has been ARRA’s effect? HIMSS: ARRA is a once-in-a-lifetime healthcare game changer. It serves as the tipping point in transitioning the healthcare sector from paper to electronic. On the positive side, ARRA has raised the level of discussion both in intensity and interest of stakeholders on the importance of IT to improving healthcare delivery. And, as of this writing, the healthcare and health IT communities are generally positive about the incentive possibilities. HIMSS notes the positive impact of ARRA as the tools included in the act that enable states to become actively engaged in health information exchange [HIE]. Conversely, there is a good deal of concern about the pending meaningful use regulations and what they might (or might not) include. Pew: As a stimulus bill? Almost none. On the healthcare portion? It created a new department at HHS [Health and Human Services], it created two new committees, and it excited EMR vendors. Buckholtz: We were shortchanged in the physician community with empty promises of help when all that really happened was that vendors got richer. de Brantes: Overall, I think it has been positive in sending the signal to physicians that the days of paper medical records are numbered and that they will have to get wired in the next two years. However, I feel that we’ve wasted six months because of the uncertainty in the meaningful use criteria. Rode: ARRA has raised significant opportunities. ARRA/HITECH acknowledges the role of HIM in the planning, implementation, and management of EHR systems and health information exchange through a variety of workforce references and funding for the expansion of HIM education. While the ARRA incentives do present a challenge of timing, the legislation also acknowledges the important role of standardized EHRs as the foundation for health information exchange and interoperability. ARRA also acknowledges the need for coordination of the nation’s electronic health information transaction and data standards efforts through the formal establishment of the Office of the National Coordinator for HIT and the HIT Policy and Standards committees. While they have been occupied initially with the meaningful use agenda that Congress has set, we look to their long-term ability to actually coordinate requirements and needs associated with healthcare delivery and the reuse of health information for public health, research, and so forth. Finally (in this manner of chunking ARRA), the legislation addresses some of the public concern with privacy and security. It has appropriately refocused attention on the HIPAA privacy and security requirements and acknowledges new needs to expand HIPAA. FTR: What has been the biggest challenge for the HIM profession this year? HIMSS: Preparing for ICD-10 conversion and meaningful use of EHRs. Rode: With the final approval to move forward with ICD-10 implementation and the new ARRA requirements, HIM professionals must take on the planning of a variety of HIM-related activities associated with classification updates and EHR adoption (purchase or updating software and implementing to achieve meaningful use during the same time period [2009 to 2015] with limited resources). FTR: What was the biggest challenge that affected the coding industry this year? Pew: The same challenge that faced most Americans in this difficult economy: how to get all the work completed properly and on time while practices are dealing with more patients and trying to get by on less resources. Stress levels are high everywhere, and coding is no exception. FTR: What was the biggest challenge facing the transcription industry this year? AHDI/MTIA: There is a desire to move a good portion of healthcare documentation to either templates, physician self-entry, or front-end speech recognition. This is a time when MTs [medical transcriptionists] should rally to establish a differentiator that validates their clinical knowledge and expertise through a competency-based national exam. Additionally, the challenge of new privacy and security regulations facing MTSOs [medical transcription service organizations] is to hold them to equal standards as covered entities. Although MTSOs have diligently protected PHI [protected health information], this new rule change means much work needs to be done in reviewing policies and procedures, auditing security protocols, and performing gap analyses to ensure that there simply are no gaps. FTR: What was the biggest challenge that affected the HIT industry this year? de Brantes: As mentioned above, the uncertainty on the meaningful use criteria has hurt the industry in a year when sales and installations should have flourished. The industry’s other challenge is to upgrade its existing applications in order to facilitate the reporting of medical record-based quality measures. Far too many systems lack that capability today. FTR: Is ICD-10 conversion moving at an acceptable rate? Pew: Yes, but it’s still early. Buckholtz: We remain hopeful that with the emphasis that we continue to place on the importance of ICD-10 implementation, physician practices will continue to move forward. FTR: With all the talk about ARRA, ICD-10, and the HITECH Act, what important topic flew under the radar this year? HIMSS: We’ve identified six topics that flew under the radar this year. They are a deficit focus on workforce issues, including education and training for all healthcare providers; lack of recognition of the importance of including informatics specialists in all systems design, planning, implementation, etc; the need for EHR systems that embrace usability principles; the need for a patient identity solution; a need to address change management issues during an EHR implementation; and contingency planning to cover the capital and operating costs of systems about to be implemented. All of these have the capacity to undermine EHR implementations and optimal use of systems to improve care. Buckholtz: A chance to fix the Medicare payment systems was voted down with little press, leaving physicians unsure again on how they can be paid appropriately. de Brantes: The value-based purchasing (VBP) effort that had been launched by [former HHS] Secretary [Mike] Leavitt stalled in 2009, and that’s a shame because the current administration agrees with the need for VBP. However, the much-needed overhaul of PQRI [the Physician Quality Reporting Initiative], the reinvigoration of hospital VBP, and the introduction of physician VBP initiatives have all taken a backseat. AHDI/MTIA: Data integrity and practical use of EHR adoption flew under the radar screen this year. There’s been a lot of debate about health information exchange and the use of electronic health record systems to reform healthcare services, yet many details have been overlooked. AHDI and MTIA recruited 62 documentation specialists from seven different organizations throughout the U.S. to participate in a one-day study on May 21, 2009. They processed 2,051 physician dictations, of which 39% were hospital inpatient notes such as history and physicals, consults, discharge summaries, and radiology reports, and 61% were outpatient notes such as new patient exams, progress notes, and consults. Sixty percent of dictations were transcribed directly from voice files, while 40% were processed through speech recognition software and then edited. Errors were defined according to standard industry definitions. Documentation specialists identified 689 dictation errors in 2,051 dictations, an average of 0.33 errors per dictation. Critical errors accounted for one third and major errors for two thirds of all dictation errors. The most common critical errors were wrong patient, wrong drug name or dosage, and left/right discrepancy; the most common major error was the use of made-up words or acronyms. The 823 dictations initially processed through speech recognition software contained 1,215 speech recognition errors before editing, or an average of 1.48 errors per dictation. Critical errors accounted for 43% and major errors for 57% of all speech recognition errors. The most common critical errors were wrong patient, wrong drug name or dosage, and wrong lab value; the most common major errors were the use of made-up words or acronyms and gender mismatch. Accuracy of the health record is critical for patient safety, along with the need to create efficient and practical methods for physicians to record healthcare encounters. According to a recent article in The Washington Post, reporter Alexi Mostrous cited a number of adoption concerns by physicians, including a disproportionate amount of time spent on entering data at a screen rather than attending to their patients. St. Mary Mercy Hospital in Livonia, Mich., switched to electronic records three years ago and found emergency department physicians spent nearly five of every 10 hours on a computer. Physician productivity and satisfaction have fallen dramatically. Until these issues of data integrity and practical use are adequately addressed, EHR adoption and subsequently healthcare reform will be difficult to achieve. 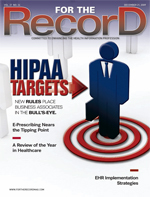 • The need for the industry to get moving on the upgrading of the HIPAA standards, which have a compliance date of January 1, 2012. • The need for a governance process for coordination and harmonization of terminology and classifications—especially needed in the United States as we expand the use of terminologies and engage in the use of terminologies that are international. • A similar need for a governance process in the use of healthcare data for purposes other than clinical care to ensure consistency in data definitions, the need to collect once (presumably in the EHR) and use for many purposes, and overall data stewardship. • The need to ensure education of all healthcare professionals in the use of EHRs. FTR: Is enough being done to eliminate medical errors? HIMSS: No. Information technology could be leveraged in many more ways to reduce errors (eg, closed-loop medication management). And concern is mounting that impetuous EHR implementations could actually lead to more patient safety risks, not less. de Brantes: Not nearly enough. Ten years after the publication of "To Err Is Human" we find that there continue to be very high numbers of potentially avoidable complications during and after hospitalizations. Chasing away defects/errors requires a very different culture and focus in provider organizations from chasing volume and price, and yet the latter continues to be emphasized and rewarded and that has to change. Our data suggest that 10% to 15% of all procedure and acute inpatient medical events are due to potentially avoidable complications. That has to get down to close to zero, yet the Medicare programs around hospital quality fall far short of encouraging this behavioral shift. FTR: Is enough being done to improve clinical documentation? Pew: We believe it gets a little better each year. Isolated, health industry people might think it’s still a large problem because a high percentage of denials result from missing documentation. But a significant portion of the problem is driven by the demands on physicians to see more patients, give more consults, learn about the latest procedures, drugs, etc. Time is very scarce and it’s easy to shortchange documentation a bit. AHDI/MTIA: Many people hear that EHR systems will improve patient safety, increase efficiencies, and eliminate redundancies. While this is all possible, it is only through effective and efficient people management and optimization of best practices that these outcomes will be achieved. If there is a rush to get an EHR in place (hence the financial incentives now with negative financial impact after 2014) without enough careful consideration of long-term effectiveness, increased patient safety, improved clinical outcomes, interoperability, and how these systems impact workflow and the potential to contribute to health information exchanges and ultimately a national health information network, we could be expecting technology alone to do things that are not practical or realistic. We applaud the need for clarity in meaningful use applications of EHR systems to ensure that patient safety and quality healthcare are the primary drivers for EHR utilization. FTR: Has the industry learned anything from Recovery Audit Contractor audits? Buckholtz: What I think we have learned from the hospitals is exactly how valuable it is to have good documentation and communication between facilities and provider offices. FTR: Has the HIT/HIM industry’s focus shifted from one year ago? • confidentiality, privacy, and security of healthcare data. FTR: What was the most encouraging development in the industry this year? HIMSS: The important role of standards in enabling an interoperable EHR has been recognized, and that success will be measured in the meaningful use of an implementation—not just that a system was implemented. Plus, the burgeoning levels of HIE activities are highly encouraging. Buckholtz: One of the most encouraging developments was CMS meeting with the AAPC regarding ICD-10. It was encouraging to see CMS recognize the strength in the AAPC membership and how important our members are to the success of ICD-10. AHDI/MTIA: There are two encouraging developments this year for the transcription industry. First, AHDI’s launch of an authenticated database reference tool in collaboration with InterFix and Stedman’s for documentation professionals. Ultimately, this productivity and quality tool will enhance the knowledge of documentation professionals while making documentation production more efficient. The second encouraging development is MTIA’s formation of the Medical Transcription Service Consortium in conjunction with ICSA labs, an independent division of Verizon Business, to drive improved coordination of care and digital record exchange among hospitals, physician offices, and healthcare clinics through a secure and private IT portal. Currently 8% of physician-patient encounters are documented via electronic medical records; by comparison, more than 80% employ the dictation-transcription process for this purpose. MTIA estimates that over 1.2 billion patient notes are dictated and transcribed annually, and currently the majority of those records cannot be imported into electronic medical records in digitally useful formats. Working with Verizon, the consortium plans to offer an industry solution for medical transcription service providers to exchange medical records in a digitally useful form. Verizon Business expects the platform to be available later this year. The IT platform under development will serve as an open, yet secure foundation for the transfer of digital patient data among physicians, hospitals, clinics, and other healthcare providers. Leveraging the Verizon Business broad portfolio of advanced IT, hosting and security solutions, professional services expertise, and global IP [Internet provider] network, the new platform will drive efficiency and improve patient outcomes as the adoption of electronic health records accelerates. Rode: Certainly the final adoption of ICD-10-CM and ICD-10-PCS to bring the United States up to par with the use of classifications internationally and to maximize the value of EHRs. Absolutely, ARRA and Congress’ recognition of HIM and the profession’s deep expertise to assist in and maintain the adoption of EHRs. FTR: And the most discouraging development? HIMSS: As the profession waits for regulations around meaningful use, systems are not being implemented. This will result in a logjam of compliance requirements and high stress as providers scramble to sign contracts and get systems implemented to meet meaningful use regulations. Also, barriers created by privacy “advocates” are preventing us all from working collaboratively to address privacy to safeguard patient information while simultaneously ensuring optimal treatment. Finally, the quantity of dubious and inaccurate interpretations of the ARRA statute has resulted in many wrongly informed professionals. Pew: The reappointment of CCHIT [the Certification Commission for Health Information Technology] as the only certification body for qualifying EMR software. Buckholtz: The most discouraging to me is that we threw money at physicians to purchase EMRs but have yet to define meaningful use. My fear is physicians will implement programs that will not be able to comply and will find themselves with no money and a system that needs to be replaced. • include the ability of certified EHRs to accept interfaced data from the dictation/transcription process and thereby enabling the use of healthcare documentation professionals, since this is the most common method used by physicians to enter care encounter data into the health record and ensures the accuracy and integrity. At the time of this writing, AHDI and MTIA are still negotiating with the Office of the National Coordinator to see inclusion of these provisions in the meaningful use definition. Rode: Probably the industry’s understanding of the use of terminologies that get confused with the role of classifications. This misunderstanding creates fears that really shouldn’t be there. FTR: Was it a good year economically for MTSOs? AHDI/MTIA: It’s difficult to say if small MTSOs had a good year economically since there is little if any economic data on the medical transcription sector, especially at the lower end of the spectrum. The sector is undergoing tremendous transformation as the healthcare system pushes for greater EHR adoption and expanded use of enabling technologies to capture health information at the point of care becomes more sophisticated. As the sector witnesses greater consolidation through merger/acquisitions and service competition at the top end of the sector, small MTSOs have the benefit of continuing to operate below the radar screen. Small MTSOs, like their small physician practice and clinic counterparts, offer boutique and customized services unique to the particular location and needs of the communities they serve and so have either garnered customer loyalty over the years or have the capability to adapt to their customers’ needs more rapidly than their larger competitors. Larger, more sophisticated, comprehensive, technology-enabled solutions to deliver digitized health records may take a while to gain traction in this segment of the industry, hence the need for the HITECH Act to create incentives for physician practices to adopt EMR systems. However, considering that the healthcare industry is essentially an overgrown cottage industry, the unintended consequences of EHR adoption, especially complex, costly comprehensive systems, may not be the answer for smaller-scaled, community-based, and rural health systems. There needs to be greater flexibility and open sourced solutions in delivering electronic health systems that meet the needs of an industry comprised of multisized service models. FTR: Did the formation of HIEs proceed at an acceptable rate? HIMSS: ARRA created a mandate for HIEs. It is amazing to realize the number of actual HIEs that are exchanging data, given that—in a pre-ARRA world—such development was completely voluntary and market driven. We’re missing an organized, centralized, authoritative information resource to make best practices available so that newer HIEs can leapfrog their progress through what others have learned; hopefully, the regional extension centers will serve in this role. de Brantes: Not really. It seems that most of the activity has been on creating health information organizations and now regional extension centers, but the actual activity of health information exchange continues to be lackluster. We have to move from focusing on the creation of organizations to the sustainability of HIE activities themselves. The meaningful use criteria should help that in the medium term by requiring EMRs to plug into data sources outside the practice, but now we need to get EMRs into practices and only then will data exchanges be possible. FTR: Which public healthcare figure stood out in 2009? HIMSS: Thanks to the ARRA, the list of public healthcare figures is long and distinguished. • Our greatest champion in the Obama administration is President Obama himself. He took a stand in the ARRA negotiations that health IT was a nonnegotiable component that had to be in the final legislation. • We would be remiss if we didn’t mention the importance of the loss of Sen Ted Kennedy, a true champion of health reform and 30-plus year supporter of the role health IT has in transforming healthcare. • In addition, HIMSS named Sen Mike Enzi as a recipient of the Federal Leadership Award for 2009, and past winners Sen Debbie Stabenow and Sen Olympia Snowe have played important roles in getting ARRA passed. • On the House side, several members had a hand in the development of the HITECH provisions of the ARRA, including Ways & Means Subcommittee on Health Chairman Pete Stark and Energy and Commerce Committee members Rep John Dingell, Chairman Henry Waxman, ranking Republican Joe Barton, and Health Subcommittee Chairman Frank Pallone, Jr.
• And the optimal leveraging of IT and management systems to improve care have received much support over the years from 21st Century Healthcare Caucus leaders Rep Patrick Kennedy and Rep Tim Murphy. FTR: President Obama probably got the most news regarding healthcare. de Brantes: To me, the three standouts have been Peter Orszag, Zeke Emanuel, and David Blumenthal. Orszag and Emanuel have stood out because of their stellar activities in healthcare reform and continuously pointing out the need for reforming incentives in healthcare as a way to keep the system fiscally sound and yielding a better overall value. Blumenthal because he has led the activities embedded in ARRA/HITECH and moved the country in the right direction to benefit from the wide adoption of HIT over the next two to five years. AHDI/MTIA: Probably nobody had a greater impact on healthcare than Sen Ted Kennedy this year, who in his passing used his legacy and his lifetime of service to set the stage for getting healthcare reform passed. One key official in the new administration who has really done a remarkable job is Kathleen Sebelius. In her first year, while getting confirmed and building a staff and team in her department, she has faced challenges ranging from helping craft the policy and legislative agenda for healthcare reform to dealing with the H1N1 scare, to making sure that parts of the stimulus like HIT that impact her area are implemented—all in her first year as secretary. * Answers provided collaboratively by the following representatives of the HIMSS North American team: Thomas M. Leary, senior director, federal affairs; Pam Matthews, RN, CPHIMS, FHIMSS, senior director, healthcare information systems; David W. Roberts, MPA, FHIMSS, vice president, government relations; Joyce Sensmeier, MS, RN-BC, CPHIMS, FHIMSS, vice president, informatics; Carla Smith, CNM, FHIMSS, executive vice president; K. Meredith Taylor, MPH, director, congressional affairs; and Patricia Wise, RN, MSN, MA, FHIMSS, retired colonel, vice president, healthcare information systems. ** Answers collaboratively provided by the following representatives of the AHDI and MTIA: Peter Preziosi, PhD, CAE, CEO of the AHDI and MTIA; Susan Lucci, CMT, RHIT, president of the AHDI; and Scott Shalett, principal with Dewey Square Group, a public affairs firm in Washington, D.C.